We've seen plenty of Doodle Jump clones, including the enjoyable Pac'N-Jump. Now there's Tap Tap Jump, a simple yet entertaining platform game with a neat color-switching mechanic. If you're familiar with those aforementioned iPhone and iPad Apps, Tap Tap Jump will look instantly familiar. 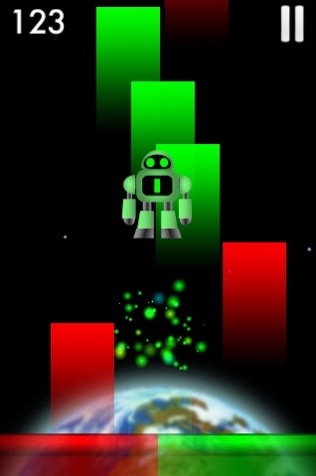 Set within outer space, the goal is to tilt your device to keep a robot named Jumping Jack bouncing to higher platforms. Ah, but if only it were that easy. The developers throw a curve by forcing you to change Jack different colors to match the platforms. So, for example, he must be green to hop on green platforms, red to jump on red platforms and so on. You do this by simply tapping the desired color on the bottom of the screen. Meanwhile, the game has a bunch of different power-ups to aid you on this interstellar journey, including a super jump and rocket boost. Is it fun? Sure. While not as addictive as Doodle Jump, Tap Tap Robot has its moments, especially when you unlock in-game achievements and compare your best scores on the leaderboards. That said, the platforms are a bit small, which makes the game tougher than it should be; we suggest playing on the iPad. In addition, the App has a barebones presentation. There's something missing. That doesn't mean Tap Tap Robot's bad (on the contrary), but it could've benefited from additional modes, boards and gameplay tweaks (perhaps floaty space controls were a bad idea). If you're curious, the game's $0.99, but it'll eventually sell for $1.99. Grab it now. What's Hot: Doodle Jump inspired play, cool looking robot, achievements, Game Center support. What's Not: Small platforms, barebones presentation, will eventually sell for $1.99.